If you want to change your GPS settings tap GPS. You can change Eco:Map's font size by selecting Font size. The available values are: 100%, 110%, 120%, 130%, 140% and 150%. If you want to be informed acoustically about changes in the database, press Bell after saving. 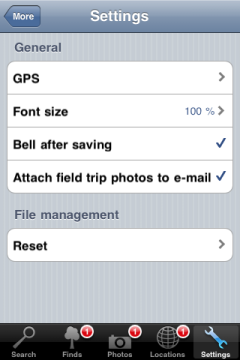 Enabling Attach field trip photos to e-mail attaches your photos to your e-mails. Please note that Eco:Map only allows attachments that are not larger than 50 MB. Otherwise you have to export your data via your browser. Reset deletes any information you stored in Eco:Map including preferences and photos. This operation cannot be undone.